Struggling with a relationship is quite normal. We all seek help to make things better in our relationships. Also, human nature is not pure of fault and making mistakes is normal. However, in this particular case, the jealousy of a woman made her do such an awful thing to her husband that it’s hard for anyone to help her or accept her apology. Her act makes up a perfect example of what jealousy could do to our sense of humanity. 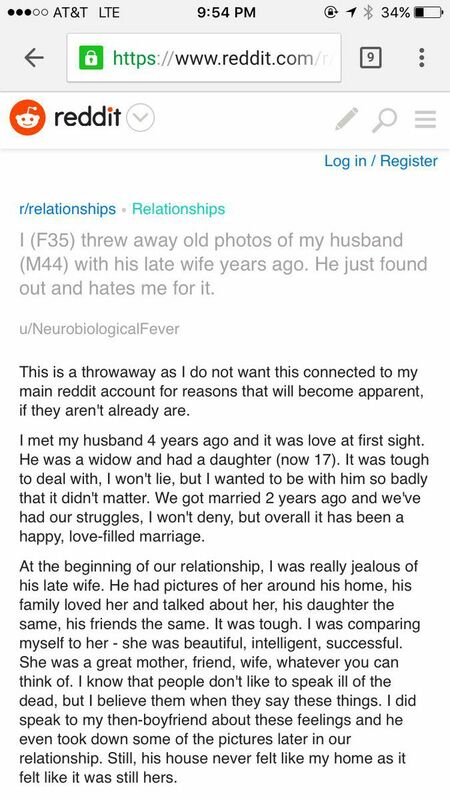 A woman who was jealous of her husband’s deceased ex-wife took all of the photos and threw them away and deleted them from his computer. She was ashamed of her act later when her husband found out and got really mad. So she decided to take the matter to social media seeking help. 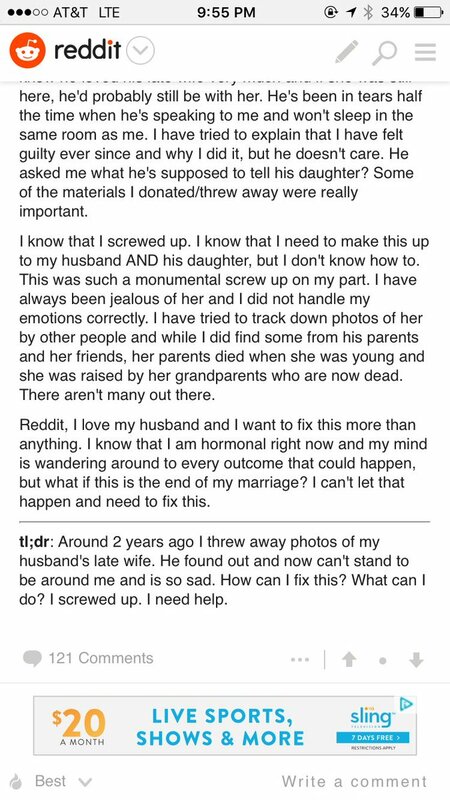 She posted in the r/relationships on Reddit explaining the evil of her actions and asked for help from the community. The original post was deleted, but thankfully someone captured screenshots. Here is the account of her wrongdoing in detail. 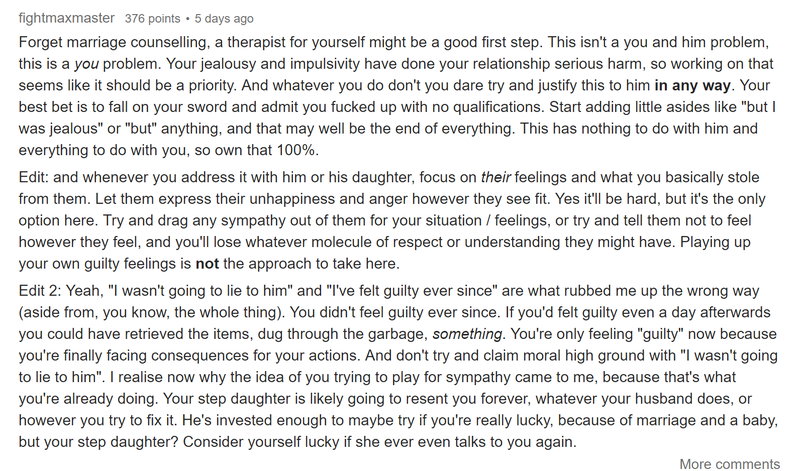 The subreddit is used by lots of people to discuss and seek help for their relationship issues. The community is super helpful and empathetic, but for this instance, they just couldn’t be. Everyone was just furious and regarded her as some kind of twisted psycho. Not only that was super unethical, but it was also not a smart move. WOW. What did she think would happen? The daughter would never ask to see pictures of her mom? Yes, she is THE WORST. And she's not actually contrite or remorseful. She's just sorry she got caught and her husband is mad at her. 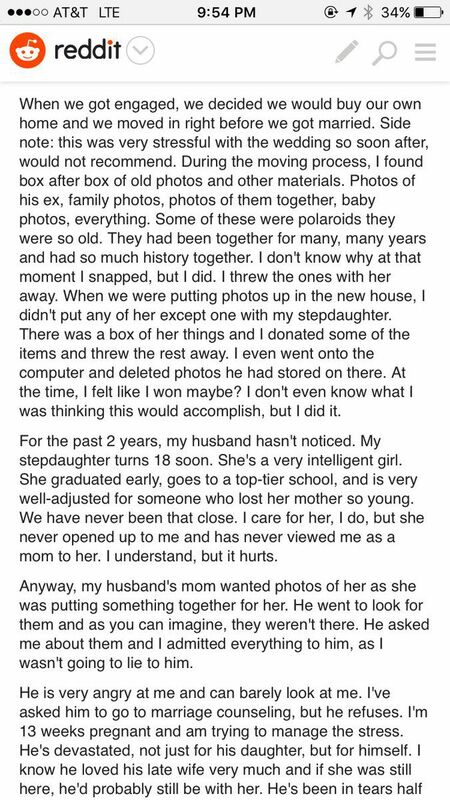 She actually deprived the daughter of her mother’s lovely memories. That’s monstrous! My heart is broken for that daughter….my .other is alive and I drink up photos of my mother like I'm in the desert ? How can anyone fix a thing like that? Like…you can’t fix that. How could you ever fix that?? She “donated” the lovely memories? The woman has serious issues. Right? That, and donating her items, takes extra effort beyond having a jealous moment. This woman has deep issues. This was a next level monstrosity.